SAS/IML Studio and SAS/INSIGHT have the same goal: to be a tool for data exploration and analysis. Both have dynamically linked statistical graphics. Both come with pre-written statistical analyses for analyzing distributions, regression models, and multivariate relationships. 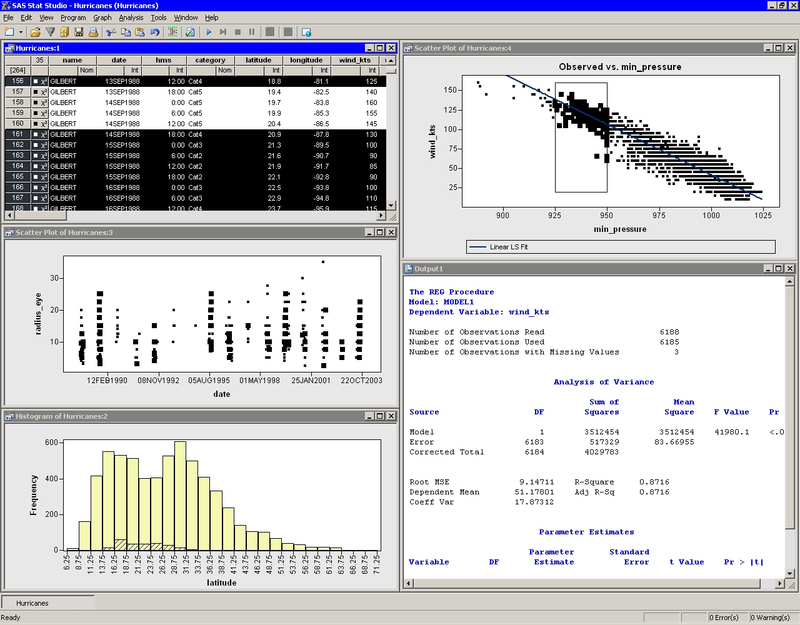 Figure 1.2 shows a typical SAS/INSIGHT analysis. 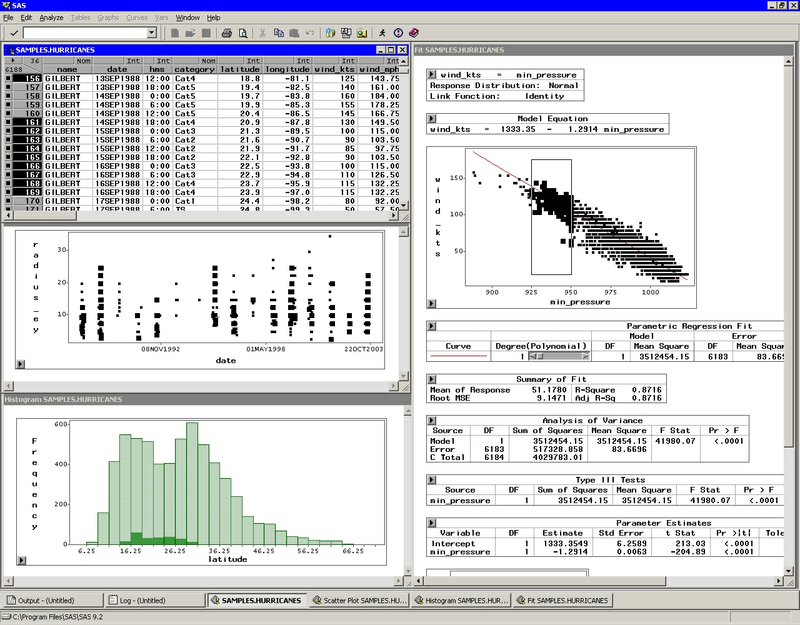 Figure 1.3 shows the same analysis performed in SAS/IML Studio. You can see that the analyses are qualitatively similar. However, there are three major differences between the two products. The first is that SAS/IML Studio runs on a PC in the Microsoft Windows operating environment. It is client software that can connect to SAS servers. The SAS server might be running on a different computer than SAS/IML Studio. In contrast, SAS/INSIGHT runs on the same computer on which SAS is installed. A second major difference is that SAS/IML Studio is programmable, and therefore extensible. SAS/INSIGHT contains standard statistical analyses that are commonly used in data analysis, but you cannot create new analyses. In contrast, you can write programs in SAS/IML Studio that call any licensed SAS procedure, and you can include the results of that procedure in graphics, tables, and data sets. Because of this, SAS/IML Studio is often referred to as the "programmable successor to SAS/INSIGHT." A third major difference is that the SAS/IML Studio statistical graphics are programmable. You can add legends, curves, and other features to the graphics in order to better analyze and visualize your data. SAS/IML Studio can connect to multiple SAS servers simultaneously. SAS/IML Studio can run multiple programs simultaneously in different threads, each with its own WORK library. SAS/IML Studio sessions can be driven by a program and rerun. SAS/IML Studio provides modern dialog boxes with a native Windows look and feel. SAS/IML Studio provides a line plot in which the lines can be defined by specifying a single X and Y variable and one or more grouping variables. SAS/IML Studio supports a polygon plot that can be used to build interactive regions such as maps. SAS/IML Studio provides programmatic methods to draw legends, curves, or other decorations on any plot. SAS/IML Studio provides programmatic methods to attach a menu to any plot. After the menu is selected, a user-specified program is run. SAS/IML Studio supports arbitrary unions and intersections of observations selected in different views. SAS/IML Studio can be programmed to call any licensed SAS analytical procedure and any SAS/IML function or subroutine. SAS/IML Studio detects outliers in contaminated Gaussian data. SAS/IML Studio fits robust regression models and detects outliers and high-leverage observations. SAS/IML Studio supports the generalized linear model with a multinomial response. SAS/IML Studio creates graphical results for the analysis of logistic models with one continuous effect and a small number of levels for classification effects. SAS/IML Studio provides parametric and nonparametric methods of discriminant analysis. SAS/IML Studio provides common factor analysis for interval variables. SAS/IML Studio provides correspondence analysis for nominal variables. Features of SAS/INSIGHT that are not included in SAS/IML Studio are presented in Appendix B, "SAS/INSIGHT Features Not Available in SAS/IML Studio."